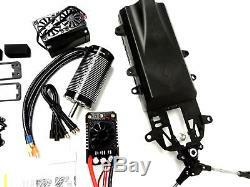 New 1/5 Rovan Brushless E-Baja Conversion Kit Fits HPI Baja 5B 5T 5SC King Motor. 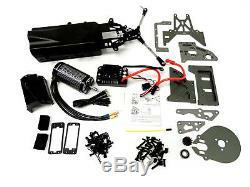 Rovan Brushless E-Baja Conversion Kit. 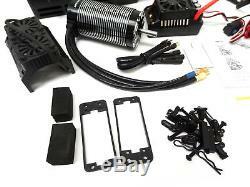 This kit includes everything needed to convert your gas powered 1/5 scale Baja to a Electric Brushless Beast! 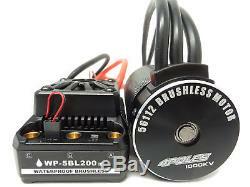 Huge 200A programmable speed control with built in ESC, support 4-8S Li-po Batteries for a total of 29.6 volts of power! Servo output voltage:6/7.4V. 1000KV 4 pole brush-less motor. Huge 8MM heavy duty steel motor output shaft. Twin cooling fans for cooling the huge 1000 KV motor. Battery box with push pull steering for better steering control. Plenty of power on 8S to push your Baja past 60MPH! 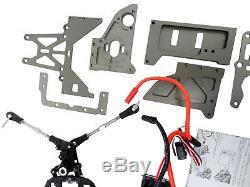 All hardware and servo adapter plates included. 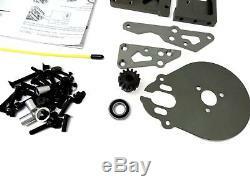 Fits: HPI Baja 5B 5T 5SC, Rovan and King Motor 2WD Baja Buggies and Trucks. We also have other vehicles and parts that vary in price and features, please look at our other store items. The merchandise must be new and unused and in its original packaging. For vehicles, we suggest a full inspection including checking that all screws and bolts are tight. Rovan RC is not responsible for vehicles or parts which are broken during a crash or driver error. Items that have been altered or adjusted in any way will not be accepted. Rovan RC cannot be held responsible for packages lost during the return process. 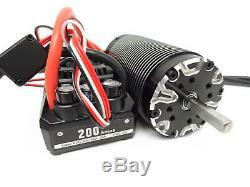 We don't just sell these, we run them and we are enthusiasts with over 40 years in the hobby. This is why the vehicles we sell have upgrades that really make the difference. All the vehicles we sell have the alloy differential, best servos from Rovan and select aluminum upgraded parts that require extra strength. Not all Rovan RC models are created equal. That is why it is important to really check what features your model will have carefully. We have looked around and this is the best deal for a Baja vehicle we have ever seen! We pride ourselves in providing great customer service. So when you have trouble with your buggy, there is someone who can help. You will not be disappointed!! Advance remote control expertise and experience is required to operative this vehicle. Remote controlled products and accessories can be very dangerous. Please read the entire operating manual before use. We have no control over the correct use, installation, application, or maintenance of this vehicle, no liability shall be assumed nor accepted for any damages, losses or costs resulting from the use of this vehicle. Any claims arising from the operation, failure, or malfunctioning of the products will be denied. "Defective on Arrival" claims must be made within 30 days of you receiving the Item. The item "New 1/5 Rovan Brushless E-Baja Conversion Kit Fits HPI Baja 5B 5T 5SC King Motor" is in sale since Sunday, September 16, 2018. This item is in the category "Toys & Hobbies\Radio Control & Control Line\RC Model Vehicle Parts & Accs\Engine, Exhaust & Fuel Systems\Electric Motors". The seller is "rovanrc" and is located in Valley Cottage, New York. This item can be shipped worldwide.